Although we’re constantly engaged in attempts to improve systems and organizations by introducing new practices and technologies, we still tend to do a mediocre job of dealing with the ensuing organizational changes. Part of our problem is that we tend to rely on very simplistic models of organizational change, when we think about it at all. I’ve recently been revisiting the issue in the literature and in my work. The organizing framework that I’m finding most robust and useful comes originally out of the work of Virginia Satir, a family therapist who adopted a dynamic systems perspective of interaction that translates nicely into organizational settings. 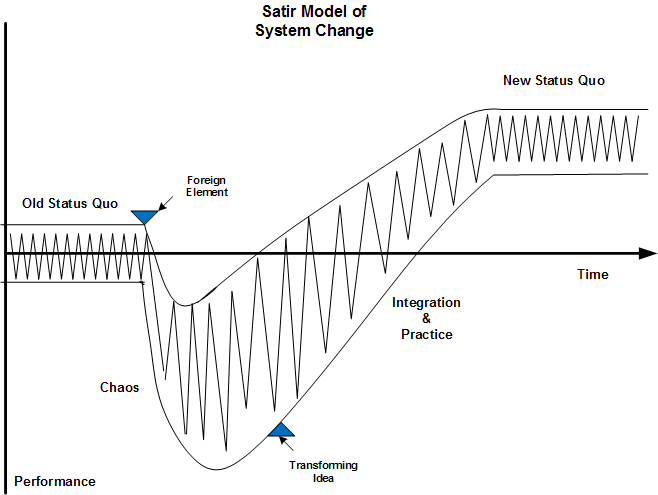 I came to Satir’s work by way of Gerry Weinberg, a long time student of technology and systems induced change. In this model, the change process starts with the introduction of some “foreign element,” which might be a new system or a new manager or a new performance mandate from on high, disrupting the “Old Status Quo.” “Chaos” ensues and performance both falls and becomes more erratic until a “transforming idea” develops or is introduced. This transforming idea constitutes a new theory about how to operate in the new system. With a good transforming idea in place, there is a period of integration and practice as the organization learns how to perform in its new configuration. Eventually, we reach a “New Status Quo” operating at a new, hopefully higher, level of performance. There are a number of features of this model that I find valuable. First, it acknowledges that performance is always variable, even during periods of relative stability. It’s an important reminder that the systems we are talking about are made up of people and we must allow for their humanity. Second, it makes it clear that change is fundamentally a learning process not a deployment process. Moreover, it is “learning how” not “learning that,” which should help us keep in mind that things will get worse as an inevitable and necessary part of getting better and that the learning will take time. Finally, there is the notion of a “transforming idea.” All too often, by the time we get to deployment, we’ve forgotten why we embarked on the journey to begin with. Articulating and sharing an effective transforming idea is an essential step in achieving the new levels of performance we are seeking. Human systems are homeostatic; they seek out and maintain stability. Absent a compelling transforming idea, these homeostatic forces will drag the system back to its current status quo. With a good “big picture” in mind, the participants in the changing system have a goal that can guide them through the necessary integration and practice. I had forgotten that Berkun also talked about Satir. Thanks for the reminder. Just to highlight the observation that ‘this transforming idea constitutes a new theory about how to operate in the new system’… while Kuhn used the term ‘paradigm’ some 22 different ways in his book, the most consistent thread through them all was the notion that paradigms will change when the prevailing means of solving the problems-at-hand no longer work… and the graph of new problems recognized and initial solutions takes off like Satir’s again from the low point. This fits with Kuhn’s description of the anomaly that pushes experimenters to examine more closely what is happening. (What I see missing from the model above (don’t know if Satir discusses it) is the essential need to suspend action and judgment in order to observe more carefully what is happening to causee the anomaly (the result that wasn’t expected ie., the current process didn’t turn out the way it was supposed to). This close observation is part of the most important change models — the experiential learning model. I really like Senge, Scharmer, Jaworski, and Flowers model in Presence (05), which is really Scharmer’s Theory of U. Again, it fits with the above model, with a shift occurring at the bottom of the U, and plans and actions shooting forward from there (similar to the ‘transforming idea’. I really like this graphical representation of the model. To whom should it be attributed? It would be a very helpful visual for groups undertaking change. Also, I like M Fidddler’s ‘curve-changer’ phrase. FYI . I’ve been working for a couple of years (in my spare time) on trying to connect all the “proliferation of models” (Senge et al) that disperses knowledge. I think we have so much more knowledge about effective change process, that we realize because it is cataloged away in separate disciplines and professional silos. I’ve created a matrix connecting these ideas but am just now getting internet savy enough to get these thoughts / info out there. I just started a blog. My goal is to create a wiki for the matrix to which people like you can add your foundation theory and old/new model. Let me know if you’re interested or have any ideas, suggestions (such as ‘are you crazy?). I’m on LinkedIn and will send an invitation, and / or you can email me. I’m a big fan of Kuhn and think that his initial point of inquiry frequently gets lost — why can’t social scientists create the same kind of structured process for creating big discoveries, and ‘revolutionary’ change’ that is employed in the physical sciences? And many seem to have missed his profoundly important answer. And that is: we in the social sciences do not have clearly organized ‘scientific communities” that hold models constant so experiments with them can be compared, and anomalies identified. Sorry I got so carried away. Thanks for your fine work. This crude graphic is one that i did myself, although it is based on a similar version done by Gerry Weinberg and another version that I’d need to track done. Also, very interested in learning more about your wiki effort. I agree with you that there is more similarity than difference among many models of large scale change.